Don’t forget there are other cars in the world that will light up your day and make you feel a little special on your drive to work. 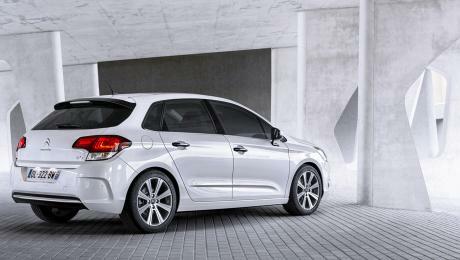 Citroen has a very nice range of compact hatchbacks available, and the new Citroen C4 is really the embodiment of strength, control and efficiency. There are loads of cars that fit the compact hatch model requirements. It’s the adventurous that find that beyond Toyota, Honda, Mazda and Nissan there are some very good Euro equivalents that can often do the job with more comfort, flair and performance. From its fluid surfaces and sharp lines, the new Citroen C4 has what it takes to set your drive apart and provide a rewarding drive. Taking a closer look inside, the flowing lines continue across the stylish Citroen C4 dash, where the blackout panel function leads the new technology levels found inside the latest C4. A large 7-inch touchscreen with navigation is a standard feature on your new C4 hatchback. A handy little connecting box is able to connect Bluetooth, USB and AUX jack accessories to keep your drive entertained and informed. Your teenagers will always love this feature; they’ll have you enjoying all the latest music via the MP3 compatible six-speaker audio system. Cruise control with a speed limiter and memory is a standard feature to keep your speed honest – always necessary with the vigilant traffic law enforcement officers out-and-about. Electric windows, an optional panoramic glass roof and climate air-conditioning are just some of the other quality features on-board the new C4. 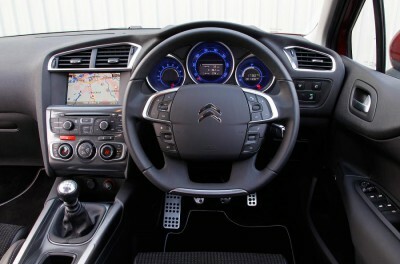 Seating for the Citroen C4 is comfortable, the ride quality leading the way in the front-wheel-drive sector. There is a nice amount of feedback for the driver via the steering wheel, and the new C4 is fun when hustled through the back roads. Cloth seats are standard in the C4 Seduction model, and that is no discredit to the leather alternative in the Exclusive models. I like the cloth seats, with their softly textured pattern. They are easy to get comfortable in with a high capacity of adjustment. The blue-lit instrument panel is stylish and very easy on the eye. Easy-to-use dials and switchgear on the centre console makes it easy to connect with the features available to the new C4 occupants. Chrome inserts and a quality plastic finish to the dash all adds up to time spent in the Citroen C4 Seduction model being nice and soothing. What you find via the accelerator pedal is a flexible and responsive engine with 1.2-litre capacity and three-cylinder technology. On paper this may not look like much but, when you experience the ease with which the new Citroen C4 Petrol can hold its own on the motorway and return some very thrifty fuel consumption figures, there is a lot to like about the latest PureTech turbo petrol technology. With 96 kW being a respectable power output for a 2.0-litre medium sedan a decade-or-so ago, you can see just how far we (or Citroen) have come. Six-speed auto or six-speed manual gearboxes are available, and they make the most of the grunty little engine. Citroen claim the new C4 can get up to 100 km/h in a little over ten seconds. Opt for the Citroen C4 Exclusive and partial leather seats, Blind Spot Monitoring, keyless entry and push button start, a Cielo panoramic glass roof, electrically folding door mirrors with memory settings, 17-inch ‘Miami’ alloys, a rear-view camera, chrome trim under the fog lights and around the front grill, automatic dual zone air-conditioning and automatic headlights and wipers are fitted. The Citroen C4 has always had an attractive design, and with the introduction of the 2016 models, the new C4 looks as striking as ever in a slippery and aerodynamic Citroen way. The headlight and tail lights have been tweaked to give the hatchback a bolder appearance. Chrome detailing on the exterior around the windows and tinted rear windows set the C4 design off really well. Standard 16-inch ‘Boston’ alloy wheels look great and keep you driving with head-turning ability. You won’t find this a hard car to drive about town, as the new C4 comes standard with parking sensors (rear only in the C4 Seduction). The leather-bound steering wheel with audio and cruise control buttons make life even easier for the driver. Drive a new Citroen C4 Petrol Hatchback with confidence and enjoy the six-year/90,000km CITROEN Confidence capped price servicing. For any more information on the Citroen C4 or, for that matter, any other new car, contact one of our friendly consultants on 1300 303 181. If you’d like some fleet discount pricing (yes even for private buyers! ), we can submit vehicle quote requests out to our national network of Citroen dealers and come back with pricing within 24 hours. Private Fleet – car buying made easy!